[ADVERT]I'm currently in the position of travelling regularly between Sydney and Melbourne and as such have learnt all possible options for getting between the two. How you do it really depends on your budget, the time you have available and the reason you are travelling. I've travelled between the two cities as a young single traveller, as a couple and family on holiday, as well as for work or brief weekend trips. I've put together a list with details for all options for travelling between the two cities. The quickest way by far is a plane journey. 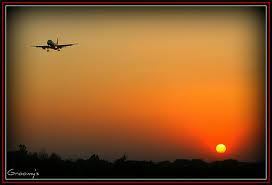 Although it takes some time to get to the airport, check in and wait around, the time in the air is minimal, you've hardly gotten up before you're coming back down again. Tiger is generally the cheapest option. If they have sale fares it can be much cheaper than the competition. The biggest downfalls with Tiger are the distance from the aircraft to the terminal. Particularly in Melbourne, if you're travelling with children it's not fun trying to get them and your bags down the tarmac and through to the shed. You also have to be very organised as they have a strict cut-off period. I generally make sure I'm there an extra half hour early if I know I'm catching a Tiger flight. Virgin Australia are probably my preferred cheaper option, however their flights are often not a great deal cheaper than Qantas. When there is a good deal or a sale though Virgin are quite good. Qantas are generally the more expensive carrier and don't offer a lot extra for the additional money. You may get fed a small snack and could have entertainment if that makes a difference to your journey. 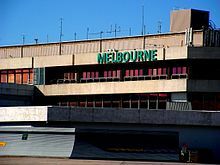 Jetstar can have some reasonable sales from time to time but be wary of them being at Avalon instead of the main airport Tullamarine. It can be a lot more breezy experience getting on at Avalon as there are far less people to worry about and getting a park is easy, however it does add an extra 40 minutes drive to your journey. Webjet is a good place to check to compare fares. Despite the apparent competition you can very rarely get a really bargain fare if you are limited in days you are to travel. If you have flexibility to travel on the off peak periods (mid-week during the day typically) you may be able to get a good deal. Having travelled often on flights, it is difficult to say for sure if it's best booking as far in advance as you can, because you may then miss a sale that comes up later on. It's definitely best, if you know you want to travel between the cities in the future to keep an eye on the fares. The best thing to do is sign up to their email alerts so you'll know when sales are on. The airport train is the easiest and cheapest way. $15.40/adult and $10.30/child The train station is located at the bottom of the terminal building. You'll need to go down approximately three sets of escalators to get there. If you know you're travelling out of the city centre, enter your final destination into the ticket machines and it will likely only be a few additional dollars to get there from the City. I find Skybus is the easiest option it's $17/adult $6.50/child each way (cheaper for return). It runs 24/7 and leaves every 10mins, taking passengers to and from Southern Cross to the domestic terminal. If you're staying at a hotel in the City you can get connecting minibuses which will take you straight there for no additional cost. Both Buses and Trains travel to and from Southern Cross station in Melbourne and Central Station in Sydney. I've done this journey just the once, in the Melbourne to Sydney direction. 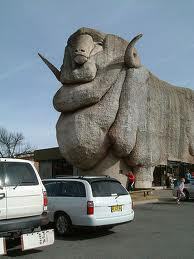 It's something you don't forget, waking up in the wee hours of the morning to get out of the bus for a quick stop and see the Big Merino. I think I had giant sheep nightmares for years to come! Buses take approximately 12- 14hrs (shorter time for the overnight). It's a long trip, so I suggest bringing along some snacks and entertainment, although there are a few brief stops on the way. It's a good option if you are wanting to see the towns and scenery on the way without worrying about driving. Firefly There are two options, you can leave in the morning and arrive by the evening or leave in the evening and arrive early in the morning the next day. The morning Firefly bus leaves Sydney at 9am and arrives in Melbourne at 11pm (for approximately $75). The evening Firefly leaves Sydney at 7pm arriving in Melbourne at 7.00am the following day (for approximately $65). The direct morning service leaves Central Station in Sydney 9 am arriving at Southern Cross Station in Melbourne 11pm. The direct evening service leaves Sydney 8pm arriving at Melbourne 8am the following day. There are other options for departure times if you are wanting to stop along the way. Prices between $79 and $125 for adults. There are also promotions for buy one get one 50% off and for kids to travel 50% off, check the website for travel periods. I have also experienced this trip, in the Sydney to Melbourne direction. Trains generally provide a more comfortable trip than buses, it's a bonus that you can get up and move around, buy food along the way etc. If you can afford the extra cost, upgrading to first class is well worth the extra comfort and peace and quiet if you are wanting to sleep on the way. If you are wanting a more guaranteed sleep, there is a 'sleeper' option for an additional cost. The sleepers include shared toilet and shower facilities and complimentary breakfast. Trains take just over 12 hours, so again it's a long journey but a good way to see some of the countryside during the day or the more comfortable overnight option. There are two options - you can chose to travel throughout the day, trains from Sydney depart at approximately 7.42am and arrive into Melbourne at 6.56pm. Or travel through the night leaving Central Station at 8.40pm and arriving at Southern Cross Station at 7.35am the following day. Countrylink rarely has sales over this distance, but it's worth keeping an eye out on the website if any discounts become available. If you're someone who likes driving (and you've really got to like driving) and have a few spare days to make the most of the scenery. There are two main routes to take, depending on your time and scenery preferences. The first is the Hume Highway route which is around 900km. This takes approximately 9hrs 45mins (not including the stops you'll need to take). The Hume Highway is the most direct route and takes you right through Central Victoria and country NSW. There are some great small towns along the way such as Yackandandah, Holbrook, Glenrowan, and Beechworth, that are either en route or a little off the track. The road is generally very good quality but also wide and dull and seemingly never-ending in parts. The best option is to make the journey a holiday on the way to break it up. You could also visit Canberra on the way through. Coastal Route (approximately 1033km) could been considered the scenic route, it will allow you to practically trace the outline of Australia from Sydney to Melbourne. Once you reach the South Coast, there are lovely towns along to explore on the way to the Victorian border. Further towards Melbourne you can check out Lakes Entrance in Victoria and end the journey exploring the Mornington Peninsula. It's a great option for a holiday trip if you'd like to explore some coastal towns on the way. Thank you for helpful travel tips. Could you offer suggestions as to how one would make the coastal trek from Sydney to Melbourne by bus (Hop On Hop Off?) or rent a car w/o incurring a $1000 drop-off fee? This is soo helpful thank you!! Thanks for the info. Are the prices you are quoting one way or return? Kim.